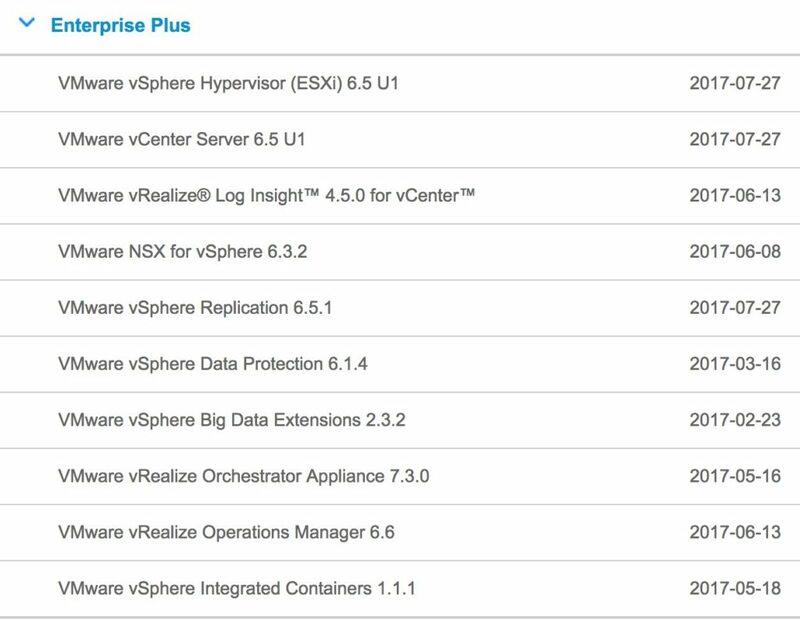 VMware vSphere 6.5 Update 1 – what’s new? vSphere Client is now capable of maintaining 90% of workflows. The recent update of the HTML5-powered vSphere Client enables the product to execute almost all working processes, except the several rarely-used ones. Here, is the most up-to-date list of operations that can (and cannot) be performed by the vSphere Client. vCenter Server Foundation supports up to 4 ESXi hosts instead of 3. This change is aimed to meet demands of the customers who have small infrastructures and need a single vCenter license for an even number of hosts. Support of third-party software has been extended. VMware enhanced compatibility of vSphere with third-party software that complements its infrastructure. In future, this strategy will prevent incompatibility of different versions of the virtualization platform with Security Key Management, Proactive HA, etc. vSphere 6.5 General Support extension. VMware extended the period of vSphere 6.5 maintenance up to 5 years. Thus, General Support expires on November 15th, 2021. Upgrade path from vSphere 6.0 U3 to vSphere 6.5 U1. VMware enables to upgrade the vSphere 6.0 U3, the latest version of the previous vSphere generation, to the recent one, vSphere 6.5 Update 1. In other words, the intermediate upgrade to vSphere 6.5 is no longer needed. Drivers update. A lot of device drivers have been updated as a part of ESXi 6.5 Update 1.
vCenter limits have been increased. vCenter server got increased limits of the supported configuration maximums for SSO-domains. This means that the vCenter Linked Mode can supply more objects managed within a virtual infrastructure. The interface of the vCenter Server Appliance (vCSA) installer is available for Microsoft Windows 2012 x64, Microsoft Windows 2012 R2 x64, Microsoft Windows 2016 x64, and macOS Sierra. TcServer is replaced by Tomcat 8.5.8. Ubuntu 17.04 guests can be customized before deploying. vSphere Update Manager can be used for the update of vSAN 6.6.1 clusters. vSphere Storage APIs for Data Protection (VADP) may use Windows Server 2016 and Red Hat Enterprise Linux RHEL 7.3 as proxy-servers for backup. Importantly, it is the last release that supports IBM DVS 5000v, HPE 5900v, and Cisco Nexus 1000v virtual distributed switches. The next release will not support them; hence, it is worthy to get used to the VMware vDS. The introduction of vSAN Performance Diagnostics. Performance Diagnostics is added to the vSAN tab of the vSphere Web Client. This function allows execution of different benchmarks and comparing the results with each other. Also, if the results that you get are not optimal, the tool will provide you some best practices and links to KB that will guide you to achieve maximum performance. Config Generation Support. The unicast communication of vSAN 6.6 with vCenter makes the vCenter the only trusted source of the configuration in the cluster. However, there was an issue before this release. If the configuration changed while the vCenter was offline, the cluster was set back to the previous reliable configuration once the connection was restored. Now, GUID and time of the latest configuration are tracked via the Config Generation feature; therefore, the misconfiguration of the cluster is avoided. VUM health checks. Regarding the fact that vSAN is updated via VMware Update Manager, new options for checking its status are available in the Health menu. LED blinking support for HP Gen9. vSAN 6.6.1 enables to initiate LED blinking of HP Gen 9 servers disk devices. This innovation facilitates identification of specific discs in the rack. This feature is available in both pass-through and RAID modes. VMware Site Recovery Manager 6.5.1 is compatible with the VMware vSphere 6.5 Update 1 and VMware vSphere Replication 6.5.1 engine, which has also been updated along with vSphere. vCenter Server Virtual Appliance 6.0 Update 3 can be upgraded to vCenter Server Virtual Appliance 6.5 Update 1 directly. This enables users to have their SRM 6.1.2 upgraded directly to the SRM 6.5.1. Though, the SRM 6.0 still requires the intermediate update to the 6.1.2 version before upgrading to the recent 6.5.1 one. The external databases Microsoft SQL Server 2014 Service Pack 2 and Microsoft SQL Server 2016 Service Pack 1 are now supported. The new guest operation systems (Windows Server 2016, CentOS 6.9, RHEL 7.3.5, Ubuntu 17.04 non Long Term Term Support (LTS)) are supported. Here, actually, is everything worthy to be updated before the upcoming VMworld 2017.